Drummer contest in San Antonio, Tx. Nearly 150 people tested their percussion skills on Saturday to see if they had what it takes to be the World's Most Accurate Drummer at the DCI San Antonio Southwestern Championship. After warming up on practice pads for a few minutes, competitors played an unchanging two-bar rhythm for two minutes on the official Beatnik Rhythm Analyzer electronic drum pad. Once finished playing, each competitor was awarded a carefully calculated score which graded their accuracy. A perfect score was 800 points, but the highest scores of the day were in the low 700's as the Beatnik Rhythm Analyzer can detect accuracy to the 512th note. Jonathan Leal, 17, a current member of the hometown Division III corps, Revolution, won the day's competition, and was named the World's Most Accurate Drummer from San Antonio, Texas. "It feels pretty sweet right now. My friends and I just went to try it out, and I ended up winning," said Leal. "I wasn't nervous at all when I was playing; it felt just like practice." 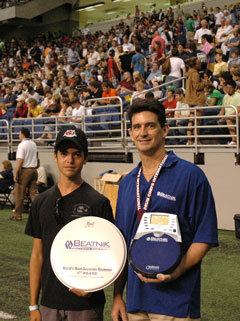 The World's Most Accurate Drummer contest presented by Beatnik Rhythmic Analyzers will be held again at the major Drum Corps International event in Indianapolis and in Pasadena, Calif. for the Drum Corps International World Championships. Learn more about the World's Most Accurate Drummer contest. Practice the lick you'll need to play for the World's Most Accurate Drummer contest.